A sunrise view from the Bright Angel Trail in Arizona once again captured my heart. A judge’s comment on the first Bright Angel design challenged me to find a way to take the deckle edge border all the way around. I also wanted to make a larger work to try to capture the nuances of the place and time. Herringbone stitches are featured in the deepest fissure, elongated for the tower on the right, and also decorate the darkest shadows in the foreground. Fabrics from the Santa Fe Opera costume department are augmented with batiks and a nuno felted foreground fabric from Daphne Sherman. 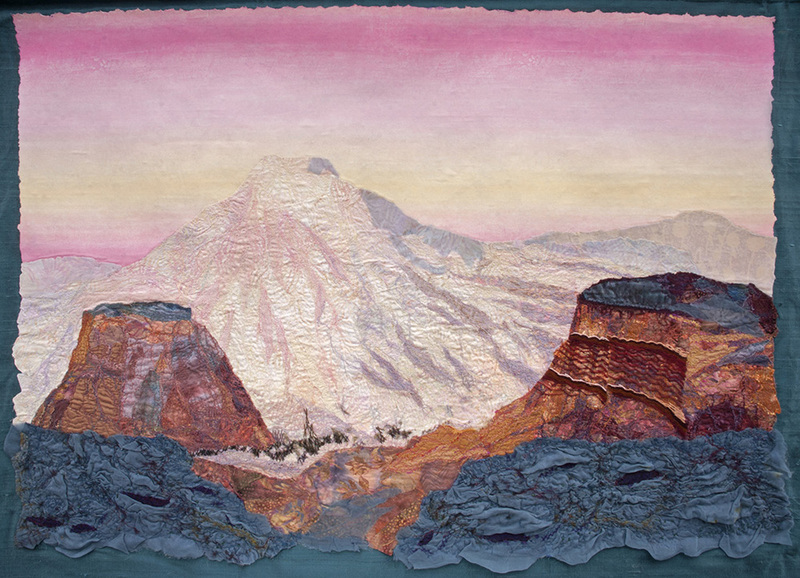 Fabric collage and mixed media with nuno felting, Silk, cotton, linen, rayon, and polyester, hand and machine stitching.